What is Marketing Resource Management, and do I need it? | Lucidpress . ', failHtml: "
Keep up with your organization's growing content needs, maintain brand consistency and empower everyone in your organization to quickly create content with the Lucidpress brand templating platform. Today’s world is a marketer’s world. Customers can be reached by virtually any medium a marketer puts their mind to. But with so many channels and tactics at one’s disposal, the list of marketing “to do’s” is much longer than it used to be. Marketing Resource Management ( MRM) platforms assist marketers in organizing and planning their long list of marketing initiatives and tasks. It’s technology that simplifies the management of otherwise complicated marketing processes, such as plans, budgets, tasks, ideation, creation, and assets. Orchestrate the strategic and financial planning of marketing initiatives. Create and organize marketing assets associated with those initiatives. Distribute marketing assets both internally and externally. Marketing Resource Management (MRM): Defined above. Digital Asset Management (DAM): Software used to organize, store, and retrieve digital assets. Some MRM softwares offer a lite DAM, but this is not as scalable or robust as an enterprise solution. DAMs are also closely related to Marketing Asset Management softwares (MAMs), which have traditionally been the best option for storage of video and audio files. Marketing Campaign Management (MCM): Software that assists with the planning, distributing, and measuring of marketing campaigns. While all three softwares commonly overlap, it’s important to differentiate the core capabilities of each to better understand which solution is the best fit for your organization. It’s also important to understand that today’s definition of MRM software is a constantly evolving one as new technology emerges. Marketing automation tools allowing for advanced personalization, not to mention the ever-growing list of marketing channels and collateral types, are just a few examples of MRM’s need for fluidity. One of the biggest draws of using an MRM is that anyone in an organization should be able to easily enhance their marketing efforts through the use of an intuitive UI. Many MRMs, however, require extensive onboarding and tech-savviness to be used effectively. An MRM should not only help coordinate marketing efforts, but speed them up too. Process-speeding features (such as approval processes and cloud-based collaboration) accelerate the coordination between teams by eliminating much of the back and forth. The most effective platforms are the ones that connect with core competencies outside their own. An MRM platform that can integrate with your legacy systems, printers, or custom distribution tools is invaluable in helping you manage your big-picture marketing. Aligning marketing processes is good but it’s not great if your brand isn’t protected in the end. A proper MRM should also ensure your brand assets stay protected and consistent from beginning to end. MRM software should also easily scale with your team or organization’s size. Cloud-based collaboration, sharing, and approvals improve your team’s communication as they work on projects or assets at the same time without stepping on each other’s toes. Are MRMs worth the investment? 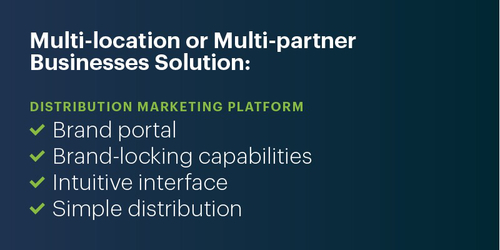 Since MRM solutions come in all shapes and sizes, and often overlap with other categories within the Enterprise Marketing Management umbrella, there isn’t a one-size-fits-all solution as to which MRM to select. In fact, the answer is often to use MRM software in tandem with other tools. This can serve as a deterrent to some. With the rise of so many softwares and technologies to choose from, companies can be reluctant to bombard their employees with yet more onboarding to systems that could be hot today, but yesterday’s news tomorrow. Despite some of the gray area surrounding the software, market conditions for MRM software look positive. According to the results of a 2017 CMO Study conducted by SiriusDecisions, Marketing Resource Management software made the top 10 list of marketing technology that CMOs will invest in over the next two years, with 39% indicating they will be investing in MRM software. The global market is predicted to be worth $9.01 billion by 2020. The short answer to whether your organization should invest in an MRM? Yes. As noted above, all forecasts point to Marketing Resource Management software as being a driving force in the future marketing world. If you don’t invest now, you may quickly fall behind. The long answer is that the type of MRM, and what platforms you combine it with, simply depend on your needs. Large enterprises require robust and diverse technologies to serve large bodies of people, assets, projects, initiatives, and distribution channels. 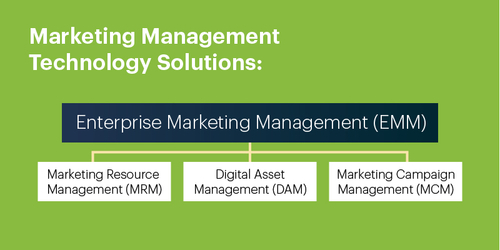 If this is your organization, your MRM technology stack should consist of a digital asset management platform (DAM), a brand templating platform and content distribution. A DAM will allow you to store and organize your brand’s massive collection of digital assets. There’s a broad range of DAM types, but the underlying capability is always the same: empowering anyone to use company assets anytime and anywhere. Photos, logos, videos, music, marketing collateral and more can be stored on a DAM. Brand templating is an emerging marketing technology, with Lucidpress paving the way. Brand templating platforms empower your organization to scale the creation of on-brand marketing content across teams and departments. Data import — Import data from Google Sheets and other sources to pre-populate templates and streamline the creation process. 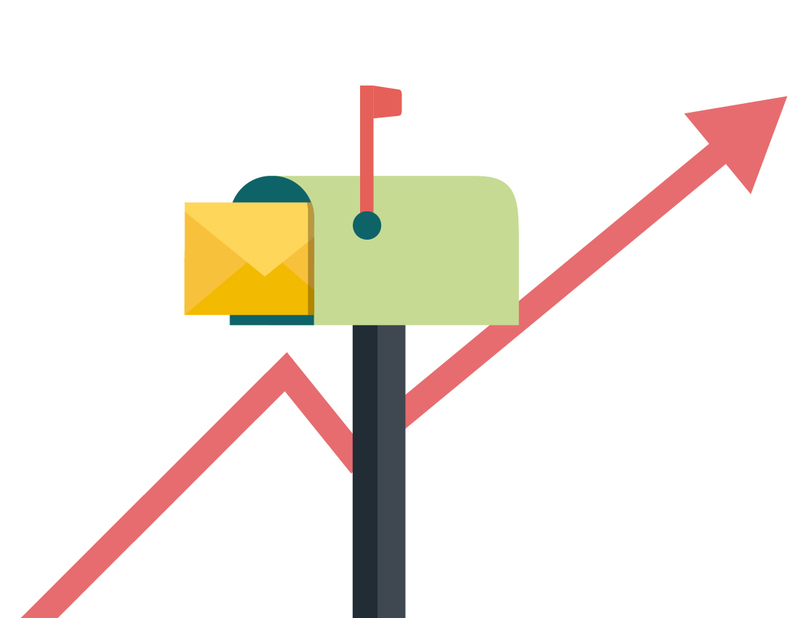 Direct mail — Design and send direct mail pieces to multiple addresses. Chances are you already have preferred methods for distributing your content. There are too many platforms and channels to mention here, but platforms are often distinguished by three categories — paid media, owned media, and earned media. For small businesses looking for a more compact yet scalable Marketing Resource Management solution, marketing portals offer all the necessary capabilities. 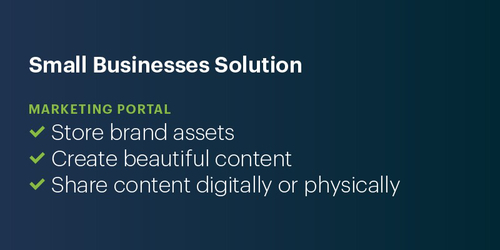 Instead of implementing full-blown systems for asset management, content creation, and distribution, a proper marketing portal empowers you to comfortably complete each step of the process without all the clutter of more developed functions your small business doesn’t need quite yet. Store brand assets — When a full-blown Digital Asset Management system isn’t necessary, you can store and manage your logos, images, fonts, and more in the Lucidpress Brand Asset Manager for easy access. Create beautiful content — Anyone in your organization can access brand assets to create and distribute professional, on-brand content. 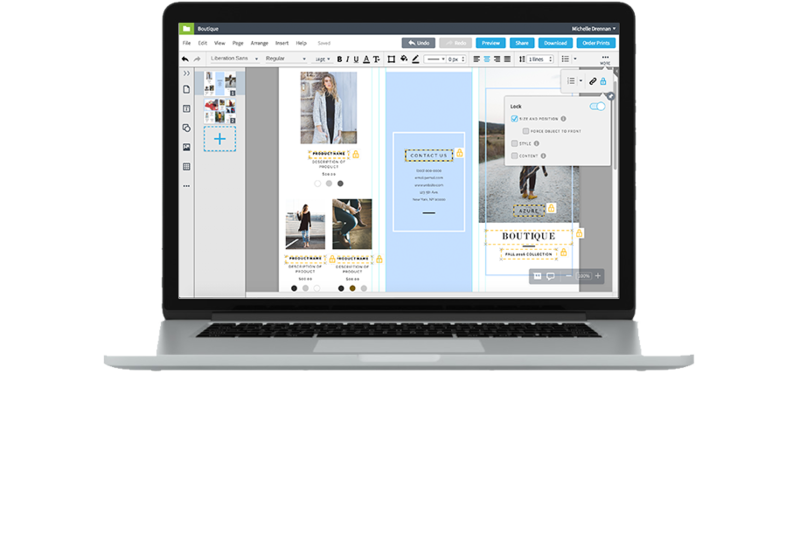 Lucidpress’s drag-and-drop editor makes it easy for even the least tech-savvy to master content creation. Share content digitally or physically — Lucidpress makes it easy for anyone to share their content either online or on paper. Options for publishing to the web, saving as a PDF, posting on social media, direct mail, or even just printing and shipping to their own door are all options with Lucidpress’s distribution services. If your organization is spread across a number of locations, channels, partners and the like, a distributed marketing platform will be the best way to go. Distributed marketing platforms are built for organizations whose brand use cases expand outside the walls of their corporate office. Franchises, for example, can include any number of owners spread throughout the world who own the rights to slap a big-name brand on their marketing collateral. But this doesn’t mean they always use it correctly. A brand portal — For storing all your brand assets in one central location. Brand-locking capabilities — In order to streamline content creation across so many parties and channels, marketers must be able to lock down brand assets to prevent unnecessary rogue content. Intuitive interface — Whether it’s a franchise owner, partner, vendor, or just a coworker in another department, your distributed marketing platform should be intuitive enough that the layman can create content that is not only on brand, but looks clean and professional too. Simple distribution — Again, the least amount of assistance required when creating or distributing collateral means time and hassle saved for everyone involved. A platform that provides a seamless and straightforward experience when sharing content either online or via print is ideal for organizations with complicated distribution structures. Lucidpress empowers masses of users to easily customize and distribute on-brand content without having to refer to members of the corporate creative team, who are already bogged down as it is. 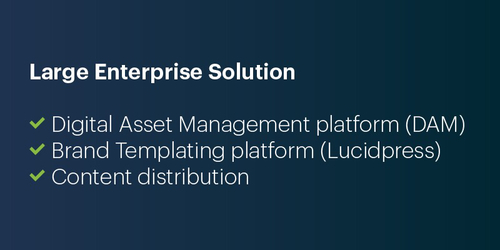 For small business, Lucidpress provides the all-in-one marketing portal solution that provides all the necessary functions for managing a brand: storing assets, creating collateral, and distributing it. For businesses that expand across locations and partners, Lucidpress enables all parties to create and deliver content across a wide range of channels with very little onboarding required.